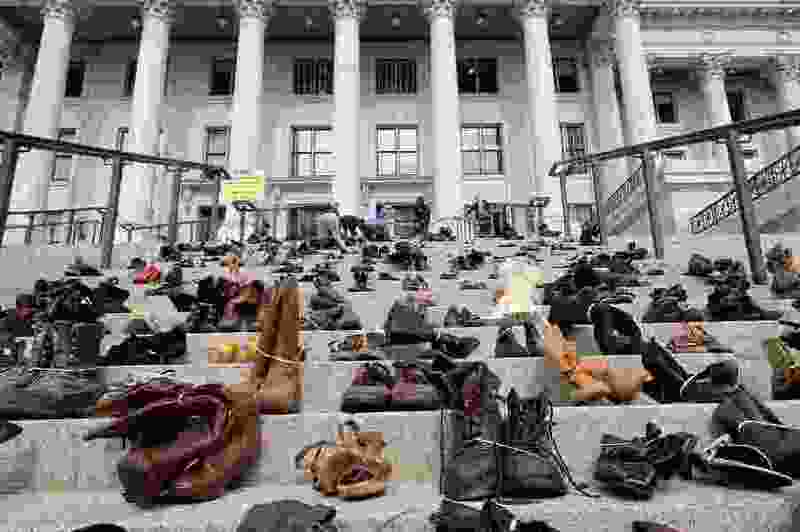 Francisco Kjolseth | Tribune file photo The Utah Capitol steps were covered with 600 pairs of shoes in February, representing the lives lost to suicide last year. Utahns continue to die by suicide at an alarming pace, state education and health officials said Tuesday in a joint effort to highlight the trend. The Utah Department of Health has now confirmed 425 suicides so far in 2017, putting the state roughly on pace to meet or surpass last year’s preliminary one-year record of 638 suicide deaths. The numbers are still shifting for 2016 and 2017, as the state Medical Examiner continues to investigate causes of death for hundreds of pending cases. For 2016, 82 cases remain inconclusive, along with 338 for this year. Elizabeth Brutsch, a health department epidemiologist, said Tuesday there remains a lot ”we just don’t know” about what’s driving the suicide rate higher in Utah and some of its neighbors, including New Mexico and Colorado, which are also among the top five states. But it’s clear the trend can’t be explained by Utah’s population growth alone. From 1999 to 2015, the suicide rate per 100,000 people grew from 15.8 to 24.5, or by more than 50 percent. Meanwhile, the national suicide rate rose by 24 percent between 1999 and 2014, according to the National Center for Health Statistics. Health, human services and education officials delivered the new data to media outlets Tuesday, part of a wider state effort to battle the trend. 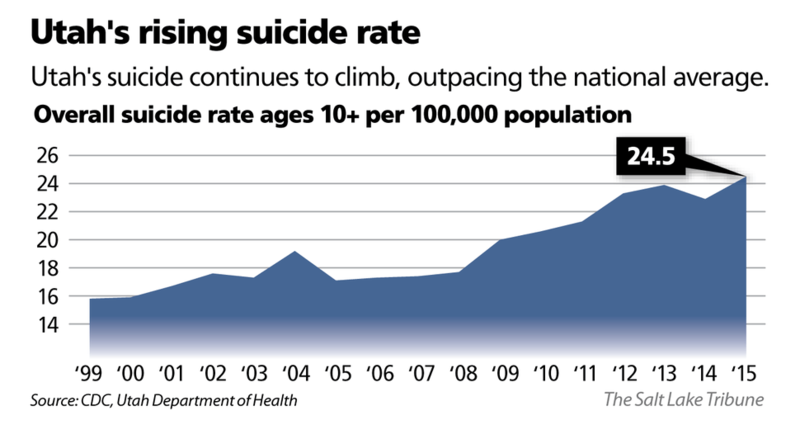 Health department spokeswoman Jenny Johnson said suicide-prevention programs need more funding in Utah — considering suicide is the eighth-leading cause of death in Utah overall, and the leading cause of death for ages 10 to 17. Health, education and other experts are attacking the problem on several fronts, Johnson said. Officials continue to push mental health first aid and suicide intervention training sessions, held around the state and designed to teach skills for talking to those who are suicidal. Another big focus, Johnson said, has been raising awareness about the risks of firearms, encouraging friends and family to remove access to guns when someone is facing a mental health crisis. Officials offered recommendations for communicating information about suicides — for reporters, but also bloggers and others using social media — to avoid creating additional trauma or copycats. Don’t oversimplify the causes of suicide, and do provide resources for those needing help, they suggested. Brutsch said efforts are also underway to learn more about the factors contributing to individual suicide cases in Utah. Utah has the fifth-highest suicide rate in the nation. All the top states are largely rural and in the West; Wyoming has the highest rate of 28 suicides per 100,000 people, according to the National Center for Health Statistics. All the states with high suicide rates, including Utah, also have higher than average rates of gun ownership, Brutsch noted, and more than half of Utah suicides are committed using a firearm. Research at the University of Utah has linked high altitude to depression and suicide tendencies, at least in laboratory rats. And there is also some evidence a stoic ”cowboy” mentality in some rural and urban communities — leading those struggling with personal issues not to seek help — may also play a role, Brutsch said. Officials are paying close attention to teenage suicide numbers. The state Board of Education has hired an education specialist to work on suicide issues, and has recently introduced a smartphone application called SafeUT that connects youth to professional help. More than 415 anonymous tips have come in through the app each month this year, according to Rep. Steven Eliason, R-Sandy, who has sponsored several suicide-related bills in the Utah Legislature. Correction: A previous version of this story misstated the suicide rate in Wyoming. In 2015, it was 28 per 100,000 people.